Enjoy your day off. Enjoy your weekend. Enjoy safety at your workplace. Enjoy your lunch break. Enjoy health and dental benefits. Enjoy overtime pay and child labor laws. Enjoy contractual protections and collective bargaining. Enjoy lack of racial and sexual discrimination. Enjoy not being fired for a bad haircut, for your religious beliefs, or because your boss wants to hire his nephew to stop him from sleeping on his couch. All of the above is brought to you by unions. And if you are lacking any of the above, what you need is union, despite what you may have heard otherwise. 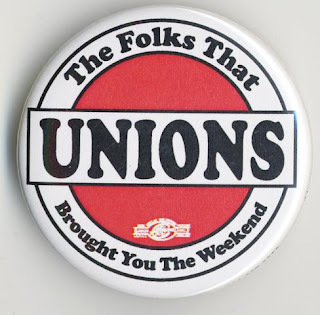 If you don't like your union leadership, don't confuse that with not liking union. Work for better leadership and better union. Vote early. Vote often. And don't even think of voting for anyone who opposes union. This includes Democrats who pay us lip service but fail to stand up when we need them. For working people, there's no alternative to union, and now's the time to make union strong. They have the money, but we have the numbers. If we stand up, there is no stopping us.